All ground floor. Three bedrooms: 2 x doubles (one with en-suite shower, basin and WC), 1 x twin. Bathroom with free-standing bath, separate shower, basin and WC. Open plan living area with kitchen, dining area and sitting area (seats 4) with solid fuel stove. Utility. 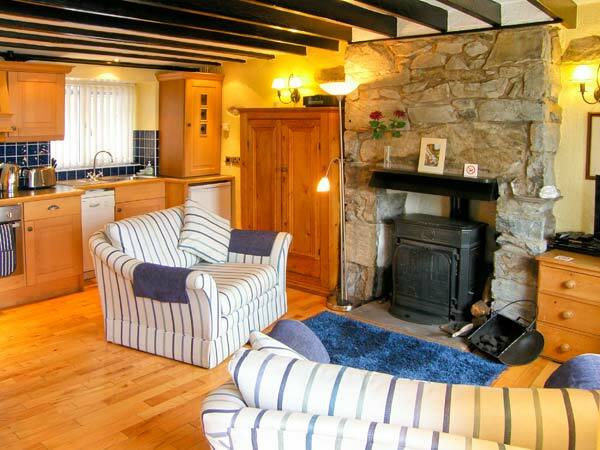 Farmhouse is a welcoming cottage close to Lisdoonvana. The cottage has two double, one with an en-suite, and a twin room. There is a bathroom, and an open plan living area with kitchen, dining area and sitting area with solid-fuel stove. Outside is ample off road parking and garden areas to the front and rear. Farmhouse is ideally placed for enjoying the Cliffs of Moher, the Burren and the rest of this lovely county. Oil central heating with solid fuel stove. Electric oven and hob, microwave, fridge/freezer, washer/dryer, dishwasher, TV with basic Sky, WiFi. Fuel, power and starter pack for stove inc. in rent. Bed linen and towels inc. in rent. Ample off road parking. Shed with four bicycles. Front lawned garden with plants plus rear gravel area with plants, patio area and furniture. Sorry, no pets and smoking. Shop and pub 3.5 miles.